Activa® Men's Microfiber Dress Socks 20-30 mm Hg Series H34 (Pinstripe Pattern) :: Orthopedics :: FLA Orthopedics Inc.
Help to prevent and relieve leg fatigue and heaviness, ankle and foot swelling/aching, mild spider veins and varicose veins by increasing circulation in the legs. 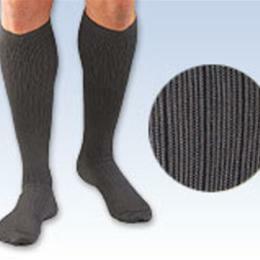 Firm, graduated 20-30 mm Hg compression. Ultra fine fibers are knitted together for a super soft touch, excellent drape and fit, and breathability. Features a comfortable, turned welt leg band that won't constrict, a non-binding comfort balloon toe, and cool cotton inside layer. Attractive Pinstripe pattern for both dress and casual wear. Comfortable, preventative support while still remaining fashionable. Colors: Charcoal Gray, Tan and Black.